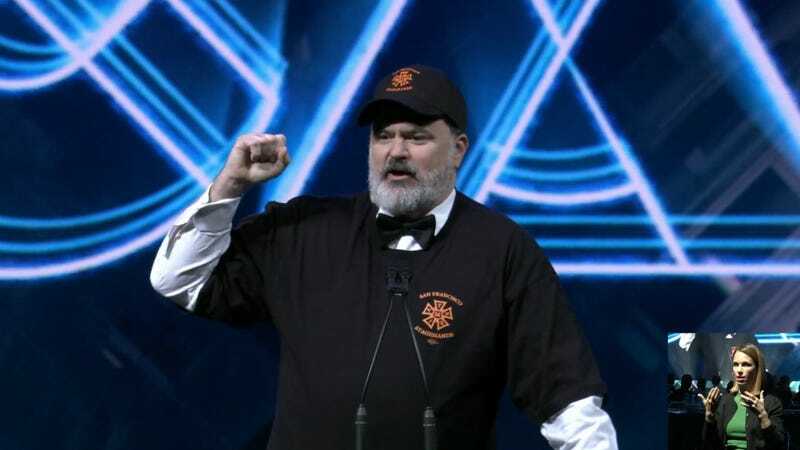 The lights-out bit was neither the first nor the last reference to unionization At the end of the show, after the developers of God of War had taken the stage to accept the award for game of the year, Schafer returned to the stage, his suit covered over with a T-shirt baseball cap emblazoned with the logo of the union whose workers were putting on the GDC Awards show, the International Alliance of Theatrical Stage Employees Local 16. In his closing remarks, he also thanked Local 16 by name. Earlier in the night, Independent Games Festival awards host and narrative designer Meg Jayanth, sporting a pin that read “UNION NOW,” made a more straightforward appeal in favor of unionization. Other developers also used their time on stage to quietly show support for the idea of unionization. At the end of the IGF show, the Seamus McNally Grand Prize was presented by Night in the Woods developers Alec Holowka and Scott Benson, the latter of whom wore a “UNION NOW” pin and recently founded a worker-owned cooperative alongside fellow designer Bethany Hockenberry to produce their next game. Reactions to these pro-union sentiments were largely positive, though some questioned the validity of Schafer’s skit in particular, given that he’s the head of a non-unionized studio. Many also pointed out the irony of Rockstar taking home the “best technology” award that night, sans any mention of the sometimes-grueling work culture that made the company a poster child for problematic crunch last year. Earlier today, video game union organizers Game Workers Unite offered to lend Schafer a hand.